Congratulations! Your metal roof installation has been scheduled. Before you know it, you’ll have a roof that’s far more environmentally responsible than the traditional shingled roof, and you can expect it to last much longer. That being the case, you can attend to your business and essentially ignore the roof for the next several decades, right? Well… not so much. While it’s true that low maintenance is one of the primary selling points of a metal roof, that doesn’t mean “no maintenance whatsoever.” Your roof is a major investment, and you want it to function properly and look its best. Read on for a few common sense tips to keep your roof looking great and staying strong throughout the seasons. A metal roof is tough, but it’s not indestructible. If trees or bushes are close by the roof, it’s possible that wind will cause branches to scrape against the surface. Over time, those constant abrasions won’t just damage the finish of the roof, they can gradually cause damage. Make sure branches are trimmed back on a regular basis, and the roof will remain in good shape. Inevitably, some amount of debris will collect upon a roof. Rain, snow, and wind can get rid of a fair amount, but some will remain. The weight of too much debris can cause a lot of problems, and that’s why it’s worth your while to minimize accumulation. Sure, a strong enough jet of water can knock debris off. We prefer to use a brush or extendable window cleaner since it easily removes debris from roofs that have a valley design. Along similar lines, too much gunk accumulating in the gutters of the metal roof can create structural issues and leaks. Remember that a metal roof is designed to get water off the roof and dry out as fast as possible. But if the gutters become clogged, it’s possible that the edges of the roof won’t dry off, and they will begin to corrode. Your roof should last a century, but not with corrosion going on. 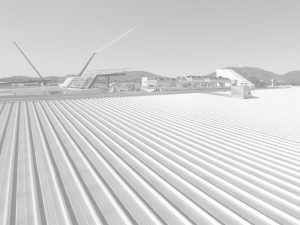 The majority of metal roofs are designed to be walked upon. In fact, walking on the roof is necessary during the installation. Afterward, try to keep foot traffic to a minimum. We know that, sooner or later, it will be necessary to walk on the roof. You’ll just want to know where on the roof it’s safe to walk, and if any kinds of footwear shouldn’t be worn. Be sure to either ask your installer or check the manufacturer’s recommendations before climbing up. Remember earlier we mentioned that your roof is designed to last for 100 years? During that time, you’ll probably have the building painted. Problem is, when painters use a sprayer to quickly paint the eaves and walls, the wind can blow a cloud of overspray on top of the roof. That’s a problem, since the look of your metal roof will be ruined, and it’s nearly impossible to get the paint off. To sidestep an issue like this, make sure your painters use brushes and rollers instead of sprayers.